Why care about the history of medicine? Professor Tomes’s “dependable if not particularly original set of answers” echoes my own: she invokes Santayana’s oft-quoted saw, “Those who cannot remember the past are condemned to repeat it”. Professor Tomes suggests that Santanyana quite easily passes muster among her colleagues in the “Arts and Sciences” faculty. It’s in the health sciences faculty that the history of medicine runs into trouble as it competes with “bioethics and literature”. In the hospital and the clinic, Santayana’s formula falls on increasingly deaf ears. So, how do we convince the everyday physician – the busy medical student, resident or practitioner – of the value of the hallowed history of the profession? I tend to associate the halcyon days of medical history – when it was held in high regard within the medical profession – with a generation of medical doctors who were respected as doctors, and especially as historians, or promoters of the value of medical history. The famed and revered Owsei Temken and Henry Sigerist were among the former; the beloved William Osler, of the latter. While subsequent generations of professional historians indubitably have served “history” well, I believe that the disconnect between medical professionals and their history comes at least in part from the replacement of MDs by PhDs in the medical history “establishment”. My “formula” is this: “doctors talking to doctors”. I submit that people of a “culture” (and “medicine” is most definitely a “culture”) will more readily listen to, and value, the words of others from the same “culture”. It may well and regrettably be true that medical school teaching budgets – both of money and of time – are too tight to accommodate formal courses in medical history. Yet, a respected clinician who spices his or her bedside or didactic teaching with historical vignettes will plant the seed of appreciation in students whose minds are open to such information. I also think it’s incumbent upon physicians and their historical associates to bring history to medical school in small and inexpensive (free is best!) doses. For instance, I have found it relatively easy to convince the provost of a local medical school to grant me time for an occasional lunch hour history presentation. (Most recently, it was a “Research Thursday” lecture: I highlighted my historical research…) These talks are pretty well attended, and we don’t even offer pizza and Cokes. Inevitably, a few students will stay after – their curiosity about medical history piqued. I also submit that we can encourage an interest in our professional history in a new generation by encouraging work by current students. To this end, the Society for the History of Navy Medicine (this blog’s original “sponsor”) offers travel grants to students whose papers are accepted for presentation at our annual papers panels, and we offer a research grant for work leading to publication in the area of naval or maritime medical history. Finally, we should bring history to the conferences that practitioners – the “history creators” – attend. Last year, the Society mounted two panels on naval medical history at the Naval Academy’s biannual History Symposium. And the year before, we mounted our panels at the annual meeting of the Association of Military Surgeons of the United States. Both of these sessions were very well attended. There is interest among medical professionals in their history. The key to getting them to listen, I submit, is to bring their history conveniently to them rather than hoping they will take time from their incredibly busy schedules to come to the historical fountainhead. 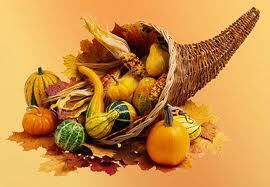 The cornucopia – horn of plenty – symbolizing the abundance of a good harvest, comes down to us from the ancient Romans. Americans have traditionally associated the symbol with Thanksgiving. We have the great good fortune to live in a nation that is wealthy enough to be able to support a robust historical establishment. University programs and fellowships produce their own cornucopiae of newly minted historians each year. Many if not most cities and communities sponsor or at least encourage local historians to accession and preserve their communities’ stories. Some corporations have historians on staff (I retired from Kaiser-Permanente, a company that does this). Even our popular culture embraces – and purchases – the works of excellent historians who have plumbed the far reaches, and the nooks and crannies of our national history. The instant popularity of Jon Meacham’s biography of Thomas Jefferson is but the most recent example of this. Personally, I’m thankful that a generous and well-planned retirement Plan permits me the leisure and the resources to pursue my own historical interests. I suspect there are a good many others like me in this country. The Society for the History of Navy Medicine enjoys the great good fortune of having a membership whose voluntary dues-donations provide generous financial support for graduate students whose papers are accepted for presentation at Society panels, and for a graduate student research grant – all to encourage research, study and publication in our narrow little corner of history. Yes, we are experiencing hard financial times, and funding for some historical work is hard to come by. Yet the work does go on. Ours may not be a perfect historical world, we do indeed have much to be thankful for. By this time in 1942 – 70 years ago – the vicious battle for the control for Guadalcanal in the Solomon Islands had been decided in the Allies’ favor, even though several battles were yet to be fought. This struggle was decisive: from now on, the Japanese would be fighting a defensive , and ultimately, losing effort. With the American victory at the Battle of Midway in June and with the realization that construction of a Japanese airbase on Guadalcanal represented part of a strategic threat to Australia, CNO Admiral Ernest King convinced President Roosevelt to modify his “Europe First” policy(1) to permit a “limited offensive” to prevent this eventuality. This led to the US Solomon Island Campaign and the conquest of Guadalcanal. Evacuation by Jeep, Guadalcanal. Source (3), p 69. Note plasma being administered (by soldier on the left) en route. stretcher carriers were the preferred means of moving men to the rear, whenever this was feasible. 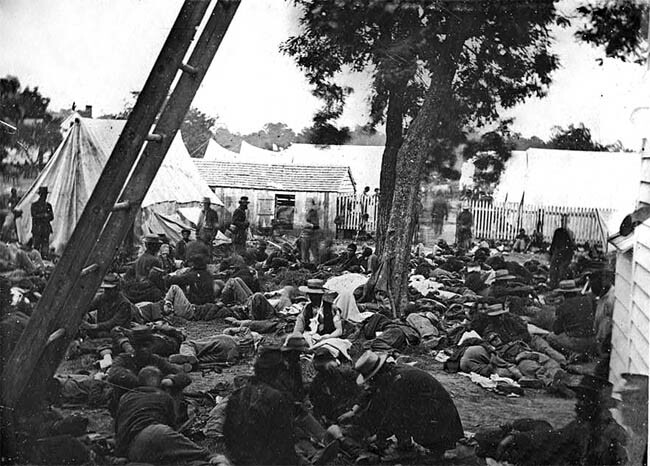 Men had to be evacuated several hundred miles from the action before they could receive definitive surgical care because field hospitals on the island were subjected to virtually daily air or artillery attacks. Air Evacuation of Casualties, Guadalcanal. Source (3), p 72. This was a tremendous morale booster, even for the uninjured. men were moved to ships offshore. 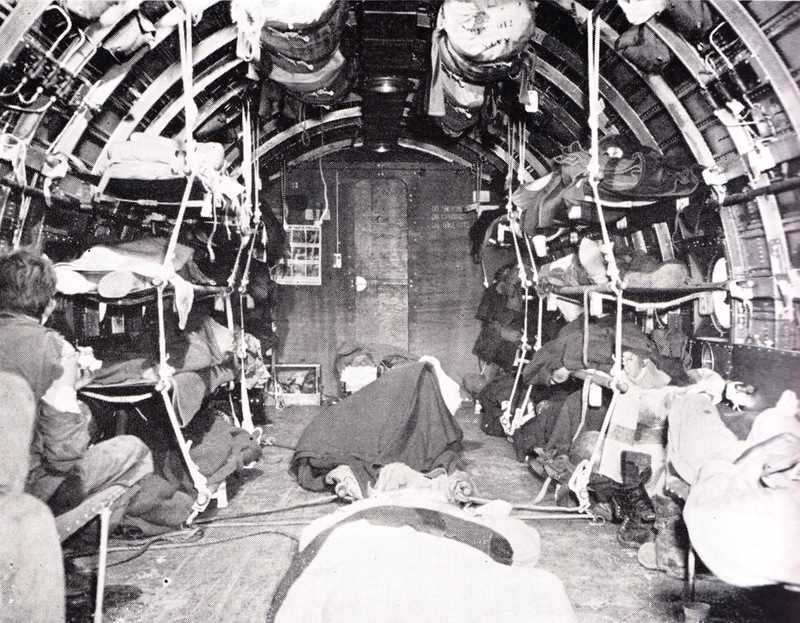 As the battle progressed, air evacuation of casualties became feasible and then desirable. By mid September, just six weeks after the assault on Guadalcanal had begun, 147 men had been evacuated by air. During October and November, more men were evacuated by air (2,879) than by sea. Specially trained corpsmen and nurses tended the men during their flights to hospitals far away from the fight. Medical officers briefed on triage for air evacuation screened out wounded men with chest or abdominal wounds, as these generally did not tolerate air evacuation at high altitude. About 7100 allied forces died to capture Guadalcanal. The island became a major transport and resupply for the duration of the war in the Pacific. (1) “Europe First” was the US strategy to fight a purely defensive war in the Pacific in order to concentrate Allied efforts on the defeat of Germany and its ally Italy in Europe. With victory in Europe assured, then Allied efforts would shift to focus on the defeat of Japan. (2) Potter, E B, Editor. “Sea Power – A Naval History”. Annapolis. Naval Institute Press. 1981. An overview of the strategic and logistical problems facing US and Allied forces in the Solomon Islands campaign, pp 302-305. (3) The History of the Medical Department of the United States Navy in World War II (Navmed P-5031), Volume I. Washington, GPO, 1953, p 73. A couple of weeks ago I wrote about my visit to USS Constellation. In that post, I mentioned that the Navy had, fairly early on, instituted a program of quite rigorous examinations for prospective Assistant Surgeons. As a result of this system, I wrote, in the 19th century, Navy surgeons generally were of higher quality than their Army brethren. Shortly after I posted that blog, my friend Army medical historian Sanders Marble wrote to say “… but wait!” Herewith, Sanders’s very heartily welcomed rejoinder. Last week Tom’s blog included the comment that the quality of Civil War naval surgeons was better than that of army surgeons. That caught my attention, and he’s graciously allowed me some space to discuss that and ask if you have any ideas about one of the underlying causes. First, from the establishment of the Army Medical Department (AMEDD) in 1818 the regulations had allowed for an entrance examination to make sure doctors were qualified. Actual procedures only developed over time, and the first examining board was not until 1832. The AMEDD also had a retention/promotion exam: after 5 years service a doctor had to pass a second exam to be allowed to stay in and be eligible for promotion. That peacetime system continued in the Mexican War. 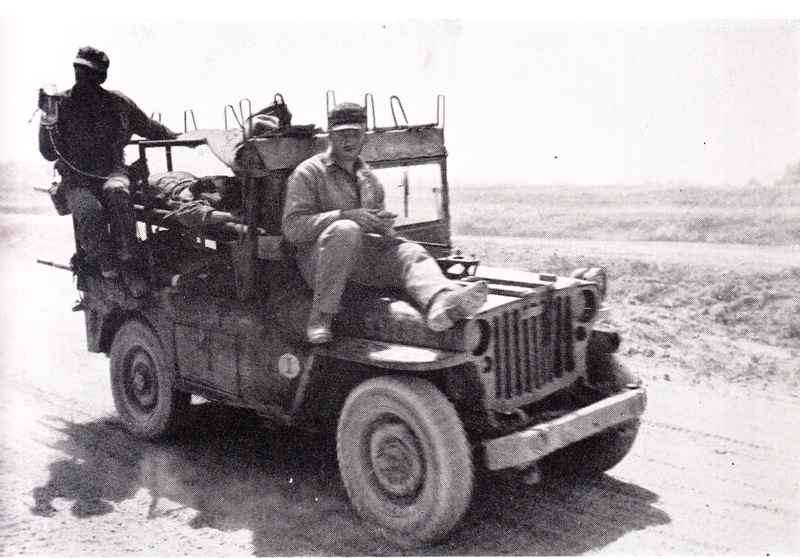 The AMEDD waived age limits on volunteer doctors but continued examinations as the Regular Army was expanded about 50%. The new regiments had to wait up to a year for their surgeons to volunteer, be examined, approved, and arrive. But the war also brought a backdoor: the volunteer regiments, enlisted by the states for the duration of the war, selected their own doctors. The AMEDD was not impressed with them: they didn’t understand sanitation, they didn’t understand Army procedures, and they were profligate with supplies. This pattern was repeated during the Civil War, but on a vastly larger scale. Most of the troops that fought were state volunteers; there were only 44 regiments of regular infantry against hundreds of state regiments. Doctors volunteering for the Regular Army still had to pass the exam, but they were a small percentage of the total serving. This created quality problems, and the AMEDD struggled to close the back door. Sanders Marble studied at William & Mary and King’s College, University of London. He has worked in the U.S. Army’s Office of Medical History from 2003-12 around a period as command historian at Walter Reed Army Medical Center in 2010. He has written and edited a variety of articles, chapters, and books on WWI, military medicine, and the history of technology. In two previous posts (here, and here), I discussed medicine’s beloved William Osler’s thought on military medicine in his early and middle years. In these times – up to about 1905, when he moved to Oxford to become the Regius Professor of Medicine – his concern was largely about individual workers and their work to discover and characterize diseases found throughout the world. Only lately (after 1900) had he come to write about the role of armies in their “public health” function of carrying out successful mass immunization programs against smallpox and, later, typhoid. What I wish to urge is a true knowledge of your foes, not simply of the bullets, but of the much more important enemy, the bacilli. In the wars of the world they have been as Saul and David—the one slaying thousands, the other tens of thousands. I can never see a group of recruits marching to the depot without mentally asking what percentage of these fine fellows will die legitimate and honourable deaths from wounds, what percentage will perish miserably from neglect of ordinary sanitary precautions ? 1915 appears to be the last time Osler spoke about war medicine, in a speech “Science and War”, given early in October. Here he acknowledged that science had, in the early 20th century, made the waging of war “more terrible, more devastating, more brutal in its butchery”. But Sir William Osler, non-surgeon, Professor of Medicine and honorary Colonel in the Oxfordshire Regiment, saw – perhaps only dimly – the future of combat medicine, also a product of science: “[an] enormous number spared the misery of sickness, the unspeakable tortures saved by anesthesia, the more prompt care of the wounded, the better surgical technique…”. Add effective shock management, antibiotics and modern imaging, and we have the picture of modern combat casualty care as practiced nearly 100 years later. William Osler survived the war, but died at age 70 of pneumonia, in 1919. It is said that he never recovered from the loss of his only son, Edward Revere, an artilleryman who succumbed to shrapnel wounds sustained at Ypres in August 1917. (1) Osler, William, “Bacilli and Bullets” , Oxford Pamphlets, Oxford Press, 1914. Accessed online at http://ia600307.us.archive.org/5/items/bacillibulletsby00osle/bacillibulletsby00osle.pdf, 02 November 2012. (3) Quoted in Cushing, Harvey, “The Life of Sir William Osler”, Vol 2, pp 492 – 495, Oxford, Clarendon Press, 1925.